Stogie Commentary: How Low Do You Go? While I’d argue smoking cigars is more of an art than a science, over the years we’ve tried to provide you with dozens of tips to enhance your enjoyment. I hope you’ll take a moment to peruse our archives for everything from fixing an uneven burn and cigar auctions to winning the war on mold and establishing a good light. My quick observations today, however, are far more subjective. I don’t claim to have the answer because, more than likely, there is no one good solution. If anything, I’m hoping to open a dialogue in which I would encourage you all to participate. 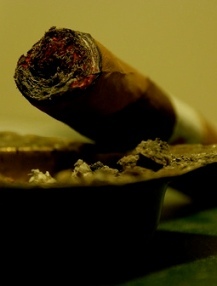 The topic, simply stated, is as follows: At what point do you stop smoking a cigar? To each his own. Jerry employs a unique style that seems to work for him. Still others practice the polar opposite, resolutely smoking each stick down to the nub. Smokers from this school know the best time to quit is a few minutes after your fingers start burning because they’re too close to the encroaching flame. I, like most cigar enthusiasts, fall somewhere between these two camps, allowing the cigar and the situation to dictate when it’s best for me to set down my stogie. Some cigars, namely those that perform poorly or develop an unpleasant taste in the final third, deserve a premature death. Others merit a long, drawn-out goodbye, especially those that improve as they progress. While the “play it by year” approach works well for me, only you can determine what’s best for you. So, before you leave today, please share your strategy with Stogie Guys readers: How low do you go? I've been meaning to ask the very same question. I, like Patrick A agree that the ciagar and situation dictate. For the most part I will remove the band as the burn reaches that point and continue to smoke until my fingers get hot. That's only for a good smoke. Really good smokes deserve a longer burn. (EXAMPLE) Oliveros, XL/52 Dbl Mad Toro (5"X52), I tried to smoke it till there was nothing left and followed the last puff of smoke till it was also gone. On the other hand, Black Pearl I couldn't wait till the band to put it out. A third of the way down and I ditched it. I don't like to relight a cigar. The first time it goes out on it's own, it's gone. This is only my opinion and I can't wait to read yours. If the smoke is really tasty, I'll burn the fingers. If not, it's done when it hits the band. It really depends on the smoke and the mood I'm in. There is no method to my madness. To me, I remove the band as the burn gets close to it. The heat softens up the vegetable gum that holds the bands making them easier to remove than at the start. This reduces the possibility of damaging the fragile wrapper trying to remove the band. Also, some of these bands which might also have a secondary band, are an inch or more. On a 5" cigar That's leaving meat(20%) on the bone if you ask me. It's also worth noting, as George E pointed out in a recent article, that whenever you decide to quit on a cigar, don't stub it out. "Absolutely, positively, do not put your premium cigar out as you would a cigarette. It will release a mass of foul odors and unpleasant smoke. Always, repeat, always, let cigars die peacefully on their own. Premium cigars are pure tobacco and, unlike cigarettes or most machine-made cigars, will not burn on their own." Depends on the cigar. Some cigars (even if they were good, and did not turn unpleasant in the final third) still don't want to be smoked to the nub – they burn too hot, or get a little harsh, or just don't taste right to me at that point. For my tastes, I've found that I usually stop smoking lighter cigars earlier than heavier ones. Maybe the harshness of the nub area is more apparent with lighter cigars. That said, my goal is to always smoke it until I can't hold it anymore. I usually always get it to the band, unless it is really bad. I don't use a tooth pick to get every last bit out of the nub. The cigar goes into the ash tray when I can no longer hold it or it no longer pleases me. Broken record here. Cigar and situation. I just don't see a reason to put down a cigar when it's good until you have to. In some circles it may be bad etiquette, but in this case, I'd rather be happy than right. I used to nub everything, but determined I was torturing myself in some cases for no good reason. Why do that? The cigar has to earn nub treatment. in fact, it has to keep earning my interest after the first third or it's going to an early, ashy grave. Like many of us cigar nuts, I have more cigars than time to enjoy them. Taste determines how long a cigar is smokable for me also. Once I was gifted a cigar so foul that I couldn't wait for it to clear the first inch and dumped it. (I know; a little patience and endurance MIGHT have been rewarded with a rich, spicy smoke, but yecch!) On the other extreme, I searched frantically for some forceps, settled on a bamboo skewer, for an old ISOM Cohiba. The British had a saying in the 19th century: "A gentleman smokes a cigar only halfway; a brute to its end." Fellow brutes and gentlemen, to great cigars for all! If you can't hold it anymore in your fingers, it's probably time to put the cigar down and light up your next stogie. I pretty much go on taste. If the taste starts to get bitter/harsh, I'll let it rest for a minute or so and see if the harshness has gone. If it is still harsh after a couple of rounds of this, it's time to put it to bed. I have nubbed quite a few cigars, but usually it's at or a little past band level. I usually smoke cigars down to the nub. If it is really bad I'll put it down after I take the band off. As most people already said it depends on the cigar. I will smoke it as long as it is still good. Usually at least down to the band, if it turns sour it is time to put it down. You don't want an otherwise good cigar to leave a bad taste in your mouth (literally). The last third is marinated in all the tastes from the rest of the cigar which usually makes it the best, or the worst part IMO. For me, it usually depends on how the cigar is smoking/burning once I get past the band. If it's a good cigar with a nice even burn & good draw, then I'll smoke it to the nub. Otherwise, I'll probably let it go right at about the one-inch point. Like others who have responded I allow the cigar to dictate when I stop. I enjoy the Edge Lite and it usually lasts to the very end for me. There have been other cigars that I stopped smoking after 2/3rds of the way because they left a disgusting taste in my mouth. I set my cigar down in an ashtray so I usually avoid the saturated end that other smokers have mentioned and some of these cigars still cause me to abandon them before I would like. I am keeping better track of my personal cigar reviews now that I am expanding my selections. If anyone has any ideas for logging reviews, then please let me know. I would also appreciate any ideas for new cigars that complement the Edge Lite or CAO Gold. It is a pretty informative site as well as having a personal virtual humidor that you can manipulate through. Once you load a cigar into it, you can rate it, keep notes on your likes and dislikes. You can share your humidor or keep it private. Give it a shot if you like. I enjoy it. My approach is identical to the one outlined in your post, i.e., it all depends on what you're smoking and your "hurry coeficient". Some cigars are really good to the bone, and taste even better in their final third. I usually smoke these until there's just a nub in my hands and the smoke gets too hot to be inhaled. When something simply doesn't live up to my expectations, though, I tend to find "technical" reasons for letting it die in the ashtray as prematurely as possible. I smoke it until I no longer enjoy it. Занимательная заметка. Добавил Ваш сайт в закладки. Не в каждом блоге сейчас встретишь столько интересных и полезных мыслей, которые можно применить на деле. Но понадобится еще время, чтобы осмыслить информацию. Даже сейчас, когда после прочтения текста Вашего поста, в тот момент, когда пишу комментарий, я думаю, о тех вещах, смысл которых мне теперь практически по другому видится. Эх, что за день сегодня – полезный день.